Manual Adhesiolysis (3 to 6 sessions at one-week intervals) are sufficient for 80% of patients. Patients who are resistant may have: an adhesive capsulitis, a metabolic problem (disruption of self healing process and resultant fibrosis and adhesion), an unnoticed surgical lesion. The biggest difficulty is in making the patient understand that their healed tendon is like a “baby” tendon and that they must gradually adapt it (not re-adapt it), as if it had just undergone a surgical operation, completely modifying their standing and sitting posture. 2. Fall on the shoulder → bleeding poorly reabsorbed → muscular fibrosis… often associated with arthrosis of the acromioclavicular joint with multidirectional hyper-laxity (e.g. neglected acromioclavicular sprains) causes subclavical muscle contraction, which lowers the lateral edge of the clavicle, gradually injuring the supra-spinatus (cf Acromioclavicular instability, «Wagner’s test»). 3. Extended seated position: rolling shoulders up and forward (attention to athletes training the anterior muscles of the shoulder without stretching). In these cases, after healing, their posture must be changed (sitting and standing) under penalty of recurrence. Two structures which cross each other or glide over one another (muscles, tendons, ligaments, capsules) may adhere to each other. Manual adhesiolysis is primarily concerned with contractions and adhesions of the muscles around the cuff tendons. 1. 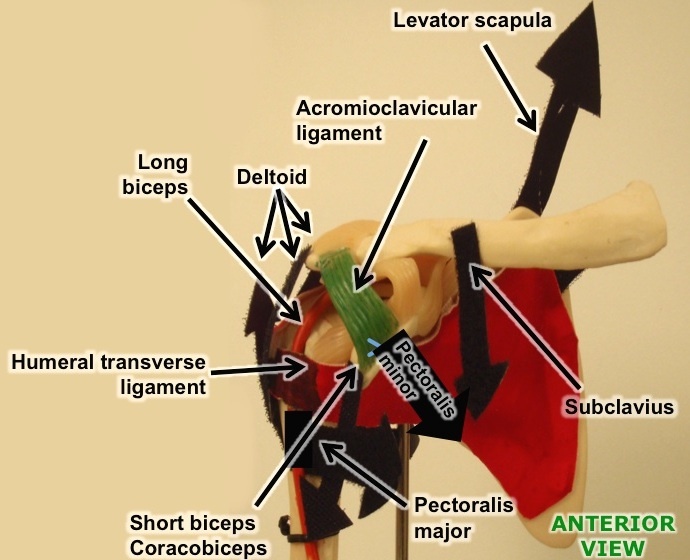 Elevation of the HH by contractions-adhesions of the deltoids ❶ ± coracobrachialis and short biceps. 2. 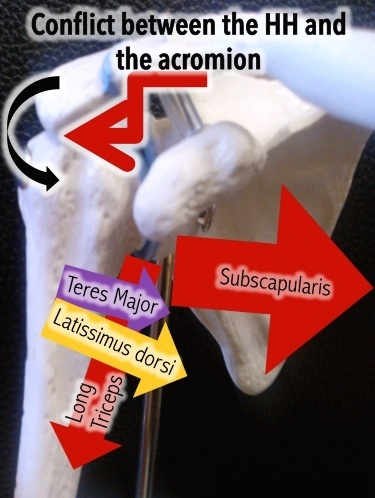 Lowering of the Acromion by the scapula lifter ❷, inferior rhomboid – more than the superior – (toggle the lower interior angle of the scapula to T6-T7) and often by adherences to the long triceps ❹ and the Latissimus dorsi muscle. The contraction of thePectoralis minor lowers the acromion and can adhere to the Pectoralis major (PM) and the coracobrachialis. 3. 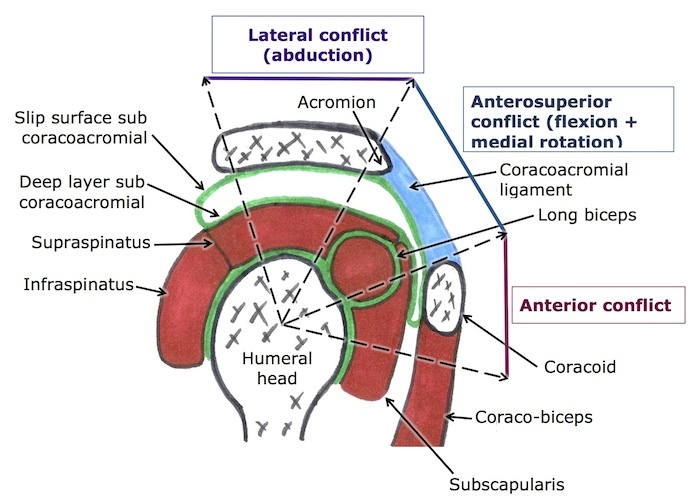 Anterior malposition of the HH + medial rotation by adhesions of the Pectoralis major (PM) ❸ = inferior prolongation of the LB groove and passes over the short biceps and coracobiceps, to which they can adhere (the coracobrachialis is a flexor, but in simultaneous contraction with the long triceps, lifting the HH). 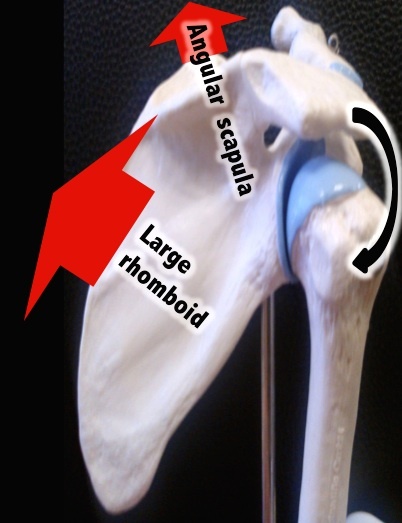 The adhesions of the sub-scapularis muscle medially decenter the coracobiceps, short biceps, and long biceps (as the sub-scapularis reinforces the humeral transverse ligament, which supports the long biceps). The humeral transverse ligament often adheres to the long biceps (the two insertions of the coraco-humeral ligament are the upper prolongation of the LB groove, covering the inter-arterial part). 4. 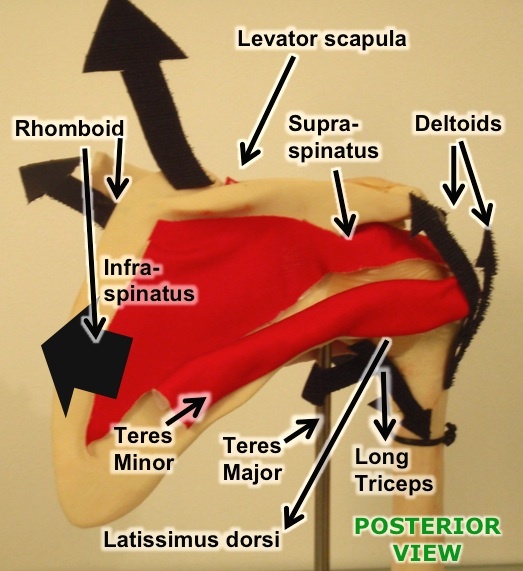 Medial rotation of the HH is possible by adhesions to the Teres Major, often associated with those of the long triceps ❹ and the latissimus dorsi. 5. 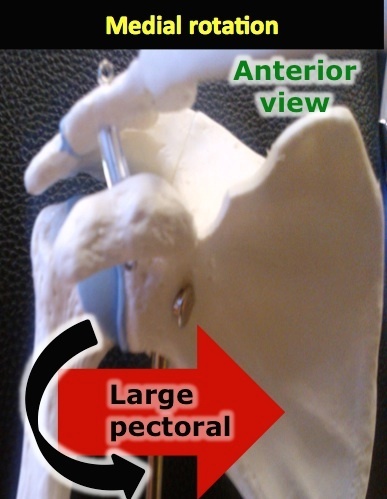 Inferior subluxation (in abduction) of the lateral clavicle by adhesion of the sub-clavius and the superior border of the pectoralis major. It is ineffective to strengthen or relax muscles retracted by adhesions, in order to reposition the humeral head in the glenoid cavity (at the bottom, backwards, and in lateral rotation), with the risk of aggravating the pain. In any case, re-centering will not hold for very long (effect of springing back). It is ineffective to treat vertebral dysfunctions of the myotomes (C1-C3: lifting of the scapula, C7-T1 small rhomboid, T2-T5: large rhomboid…) without previously having released the muscles involved. Indeed, inter-vertebral faults reappear through the “springing back effect”. 1. Re-centering the HH is made possible by inter-fascial liberation of the muscles aided by dynamic manual adhesiolysis before the trapezium. ❶ Deltoids (then supra and infra-spinatus) anterior, middle, posterior. ❷ Lifter of the scapula + inferior and superior rhomboid ❸ Pectoralis major, then sub-scapularis, pectoralis minor, coraco-biceps, short biceps and long biceps ❹ Sub-Clavius and upper lead of the LP. ❺ Long triceps + Teres Major + Latissimus dorsi. 2. 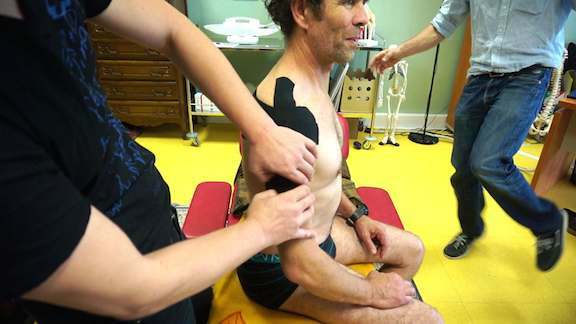 Followed by taping, or even better a Ktaping (unreleased product) to center the muscles, avoiding that they would “re-adhere”. 3. Wearing a soft brace (the type rugby players wear) during activities greatly relieves stress. From the first manual adhesiolysis session, the shoulder is freed and the cuff tendons can finally begin to heal (six weeks or more for a transfixing lesion). The patient can self manipulate, stops the daily painful motions, and learns less painful motions. 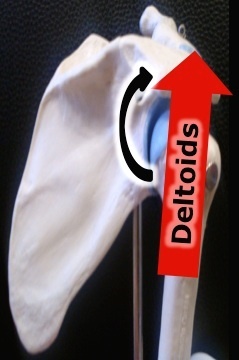 Stretching of the posterior shoulder and especially the anterior (maximum of retraction), without pushing on the lateral side. For this stretching not to be painful, the arm must remain at the side of the body. Recently, in ultrasound, J.-P. JOURDAN pays attention to micro-crystals facing painful areas resistant to classical manual adhesiolysis (eg: Long biceps sheath). The improvement can occur during an Very Deep Fasciae Unrolling : “as if” one removed and dissolved these irritants of cartilage, nerves or fascia remaining “glued”. The ultrasound shows immediate changes (to understand). Would Adhesiolysis crush these “misplaced” crystallizations on damaged tissues, maintaining micro-erosions? The Deep Fasciae Unrolling would seem the most suitable.